Education at the level of a university (including colleges teaching at an equivalent level) is known in the UK as higher education, and education at a lower level than this which is taken by someone over the age of 16 is known as further education. The main qualification obtained at a university is known in the UK as a degree (in the US it is referred to as your major), and someone studying for a degree at a university or college is called an undergraduate. A first degree, usually based on a single subject, is called an honours degree (this is often abbreviated to Hons) or a bachelors degree. The most common qualifications include a BA (Bachelor of Arts), a BSc (Bachelor of Science), a BEd (Bachelor of Education) and LLB (Law). The grades if you pass are known as a first class (highest, often shortened to "a first"), a second class ("a second"; sometimes divided into an upper second - 2:1 or "two-one" - and a lower second - 2:2 or "two-two"), and a third class ("a third"; the lowest pass grade). Undergraduate courses normally have three terms of 8-10 weeks each year, and usually last for three years (usually four years for Scottish courses). An academic year normally starts in the autumn (late September or early October) and finishes in the summer (mid-June), although you may be asked to attend a pre-sessional course before the start of the academic year. Many universities offer a 1-year diploma or foundation course: these courses can sometimes be started at different times of the year (for example, in January, April or September). These are designed to prepare students for a full undergraduate course. 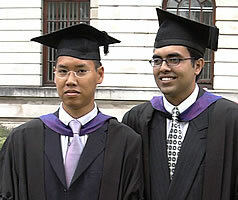 If you are a university student in Europe, you may be able to study in the UK as part of your university course. If your university takes part in the Socrates Erasmus ("European Community Action Scheme for the Mobility of University Students") programme, you can spend between 3 months and 1 year in the UK at another European university which is also part of the scheme, and you may be able to receive some money from the European Commission to help with the extra costs of studying abroad. For further details, see: http://www.britishcouncil.org/erasmus. A course search facility is available from the UCAS (University and Colleges Admissions Service) website: http://www.ucas.com/students. There is a map of university and higher education colleges on the site, and direct links to each of their websites. You can register on this site to take a free test called the Stamford test, which is designed to help you to find courses which are relevant to your skills and interests. Hot Courses provide a directory of courses at: http://www.hotcourses.com. This includes a section of information for international students. If you are currently in the UK, visit your local reference library or careers service. You should be able to see reference publications, and there may also be copies of university or college prospectuses. To judge the quality of a university's undergraduate course in a particular subject, you can refer to ranking tables. Tables are available in the "The Complete University Guide": http://www.thecompleteuniversityguide.co.uk. There is another set of tables available from The Guardian newspaper: http://education.guardian.co.uk/universityguide. One common way of ranking is based on the average grades of students entering the university to study the subject (A-levels or Scottish Highers are the exams taken by UK students before going to university). Although they can be useful as general guides, do not place too much importance on the ranking when making your choice. To read comments from other international students about a university, see: http://www.iagora.com/istudy. When British students apply to a university, they are normally given a conditional offer, setting minimum grades required in their A level or Scottish Higher exams, which are usually taken at a secondary school (high school) at the age of 18.
International students are not expected to take these exams: an assessment is made based on the qualifications obtained in the student's own country. In addition, universities also require evidence that the English language skills of international students are good enough. Often students must have a recent IELTS score of at least 6.0, a paper-based TOEFL score of at least 550, or a computer-based TOEFL score of at least 210 (check your university for their requirements). For more information about these exams, see English/Exams. You may be able to take an English course at the university or college before the main course starts (a pre-sessional course). For information about studying English at a language school, see: Course/Language. If you are in the UK, try to attend a higher education convention (sometimes also called an "HE convention", "higher education fair" or "HE fair"). These events take place in major towns across the UK between February and July each year. They give you an opportunity for you to meet representatives of the universities or colleges, to ask any questions you may have about courses, admissions processes, costs or scholarships, and to collect prospectuses. You can find the dates on the UCAS website: http://www.ucas.co.uk/events. Once you have chosen your university or college, or you have narrowed your choice to a few, it is a good idea to travel there to attend the open day. An open day is a chance for you to find out more about student life or the application process, and to look around the buildings and local area. To find out the dates and to book a place at an open day, see: http://www.opendays.com or check a university's website. For information which may help you to arrange your travel to a university, see: Travel/Transport. If you are not in the UK, contact the British Council in your country (see: Links or http://www.britishcouncil.org/new/articles/maps). Representatives from UK universities and colleges sometimes travel abroad to meet prospective students at presentations or interviews, or to attend a local "study abroad" or "UK education" fair. The British Council may also organise seminars explaining about choosing a course, applying and living in the UK. - providing high school leaving certificates to prove that you have obtained the qualifications which you claim. - providing a course transcript from your high school, showing the subjects studied, dates and the grades obtained. - writing a personal statement. This outlines the reasons you have for wanting to take the course, and why you think you are qualified to take it. - you may be asked to attend an interview, possibly by telephone if you are not living in the UK. Check application deadlines as early as possible. If possible it is a good idea to plan about a year in advance (for example, it is usually best to apply before the end of December for a course starting the following September). Contact the British Council in your country as early as possible to find out about scholarships which are available to study in the UK. For information about sources of funding, see: http://www.educationuk.org/scholarships. General information is available at: http://www.britishcouncil.org/learning-funding-your-studies.htm. UKCISA also provide information at: http://www.ukcisa.org.uk/pages/fundsource.htm. The book University Scholarships and Awards (see below) lists scholarships awarded by UK universities or colleges for undergraduate study, including sections about awards which are available for overseas applicants. Some awards are available for any student at the university or college, while others are only for students who are studying a particular subject or who are from a particular country. Usually you have to apply for a place at the university and receive an offer of a place before you can apply for one of the scholarships. There is a scholarship search tool at: http://www.studentmoney.org. It may also be worth asking your school or university and your government's education department about scholarships. International organisations such as the World Health Organisation (http://www.who.int), the FAO (Food & Agriculture Organisation: http://www.fao.org), UNESCO (United Nations Educational, Scientific and Cultural Organization: http://www.unesco.org) or the Rotary Club (http://www.rotary.org) sometimes provide financial assistance for studies which help to promote the objectives of the organisations. If you are from a Commonwealth country, you may be able to find useful information from the Association of Commonwealth Universities: http://www.acu.ac.uk. There are also EU scholarships for people who are from countries in the European Union. Information on support for EU students is available from the DfES (Department for Education and Skills): http://www.dfes.gov.uk/studentsupport/eustudents. You may need to learn about study skills (for example, how to manage your time, write essays or give presentations) before you start your course. Courses may require you to express your opinions in seminars and to work together in teams for some assignments. The way of teaching and learning may be different in the UK from what you have experienced in your home country. The marking system in the UK may also be different, so ask how well you are doing if you are not sure. It is not common for very high marks to be awarded for essays: a typical marking range is A (excellent): 70-100, B (good): 55-70, C (pass): 40-55, D (poor): 25-40, E (very poor): 0-25. UKCISA provide guidance notes for students on "Preparing for study in the UK" and "Study methods in the UK" at: http://www.ukcisa.org.uk/student/information_sheets.php.